Ethical shopping can include a whole variety of things. It is very personal what matters to you. For me, I want to be sure that the people who made my clothes were paid a decent wage and treated kindly. If you are vegan, it might be important to you that the company you buy from sells no leather goods. No one can make all these changes at once. It would be a bit like saying ‘I feel a bit fat today so I’m not going to eat next week’ or ‘I’m going to declutter my whole house this weekend’. As someone who has been trying to live a more ethical life for a decade or so I still make mistakes and I still slip up. 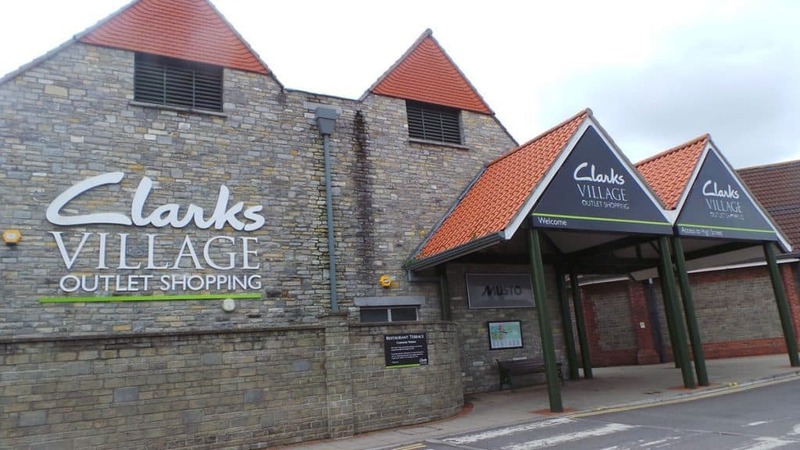 I believe that small changes make a huge difference though and that was why I was really excited to try an ethical shopping trip at Clarks Village. I went on a Friday afternoon with my Aunt Meryl who has an eye for colour and an instinctive knack of knowing where a shop will be. As kids, a lot of people fall into either Meccano or Lego camps. With footwear it was Clarks or Startrite. Me, I’ve always been a Clarks person. From my much hated ‘pastie’ school shoes to more recent purchases of very comfortable and rather beautiful boots, I have had a very long relationship with this particular footwear retailer. In the 90’s Clarks no longer manufactured shoes in Street. 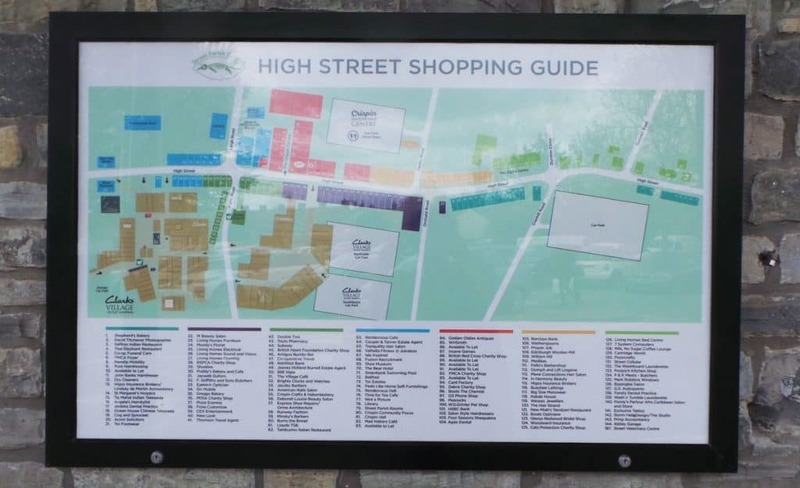 Instead, they used the land the factory was on to create a large retail park which now has around 100 retailers selling everything you would find on the high street but often much cheaper. The stores are outlets, selling last years stock of everything from designer fashion to crockery as slight seconds, last seasons stock and returns at bargain prices. 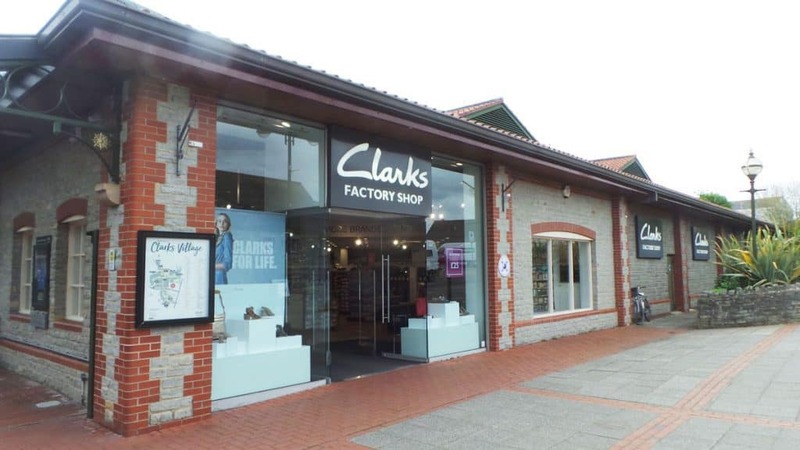 A big draw at Clarks Village is the actual Clarks Factory Shop and since they are making boots up the road again it is always full of reduced price shoes. It is especially good for kids shoes and the prices are better than any sales in their normal shops. 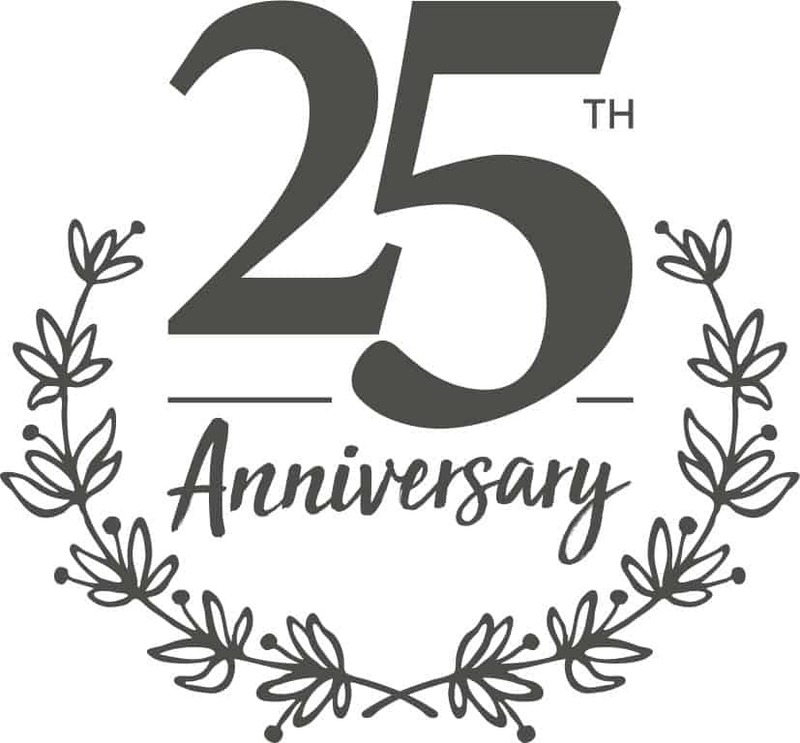 This year is special for Clarks Village because it is the 25th anniversary of the site in Street becoming the first outlet shopping centre in the UK. If you like a party check it out on the 11th and 12th August 2018 because there will be a big celebration. They say it will include all things 90s, cake, music and activities! 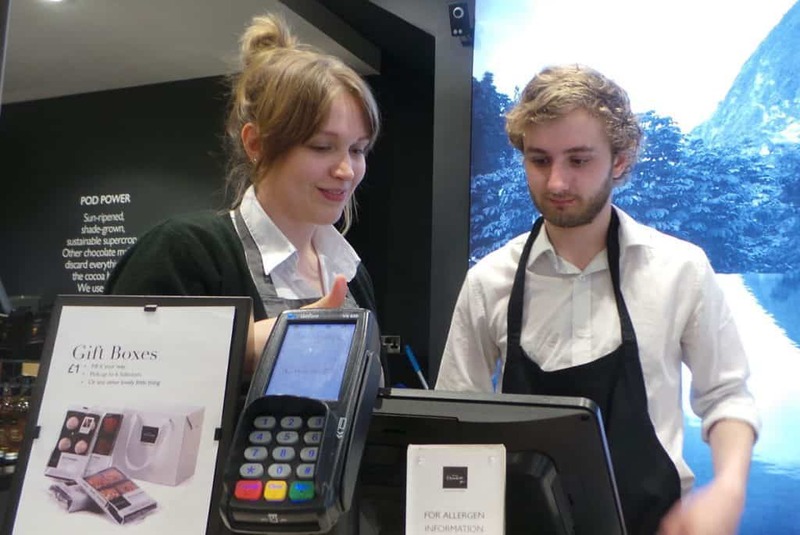 I was given a £25 voucher by Clarks Village to write this post. As always, I treat money with reverence and I wanted to do the best possible with it. I started by doing a bit of online research. I eliminated the shops I clearly would not have the budget for and did quick searches for some of the others. There are a couple of tools that can help you here: www.ethicalconsumer.org will let you do a couple of searches without creating an account and it has a huge database of products and companies. The Good On You app was developed in Australia to let people check ethical credentials while out shopping. It works in the UK too but only a few retailers are graded. I did my research by simply typing in the shop name and the words “ethical policy”. If it was hard to find, I discounted the company, I was looking for transparency. Clarks themselves are doing great things with their shoeSHARE project. You can leave old shoes in the stores and for every tonne of shoes, a donation is made to Unicef which goes towards education programmes around the world. I was surprised that a lot of the shops in Clarks Village are actually a lot more ethical that I would have imagined. The big shining ethical star of all the stores at Clarks Village was Seasalt. Started in Penzance, this company is proud of everything it produces in the UK and they are equally proud of the environmental campaigning and fundraising they do too. 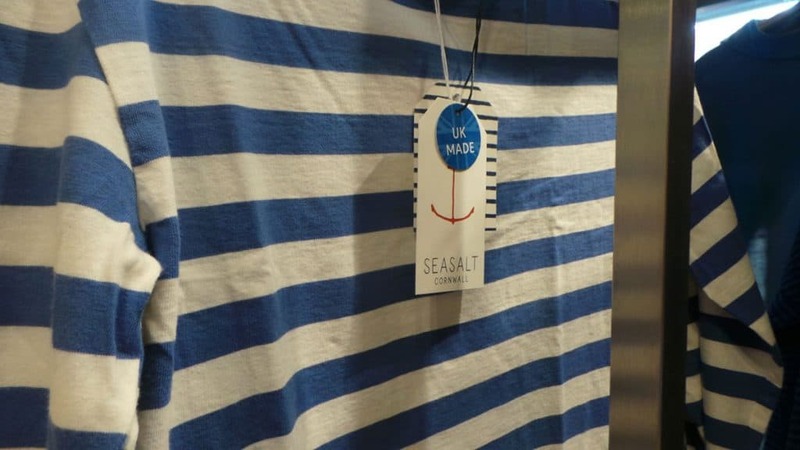 Seasalt were the first fashion company to have garments certified by the Soil Association in 2005 and are always on the look out for new sustainable options. They sell gorgeous bamboo socks and clothing too. “We’ve always tried to run Seasalt so that it has a positive impact on the world around us. For us, that means producing products in the most responsible way, thinking about the impact on the environment across all our activities, and treating people as fairly as we possibly can. All organisations have this responsibility and to this end, we’ve laid our aims and achievements. 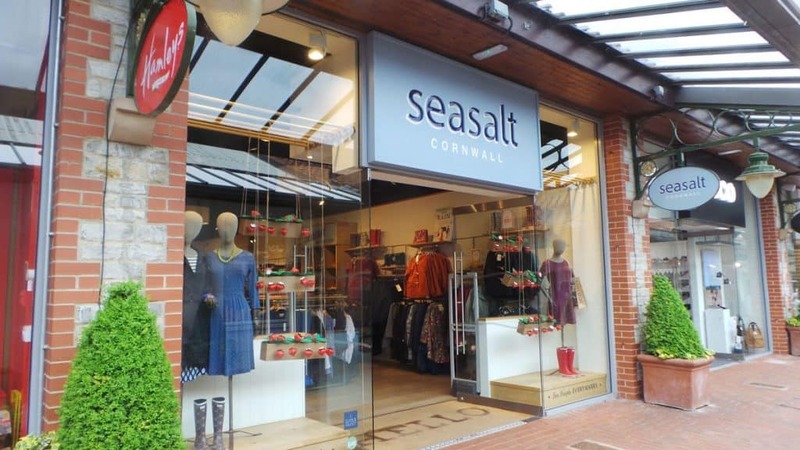 I have been in the Seasalt shop in Bristol city centre but it was way out of my budget, even the sale rail had nothing I could afford. So I was a little sceptical about my chances of finding anything in the Seasalt Outlet at Clarks Village. Boy was I wrong. 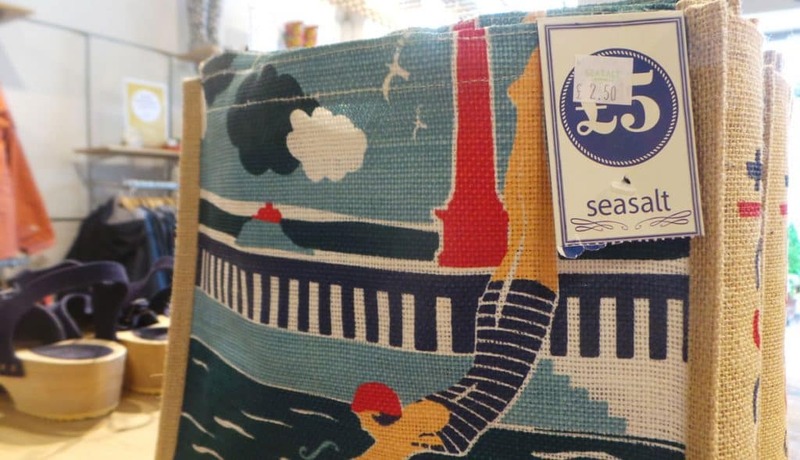 For my £25 I could have got a top, a hat or espadrilles and a jute bag at Seasalt. There are proper bargains to be found here. If I’d had more money I could have easily bought a few key items that would last for years. I spent £8 on an organic cotton sleeveless vest with a nice little gather detail at the front and fine crochet detail around the neckline. It is the most incredible blue in super soft cotton. 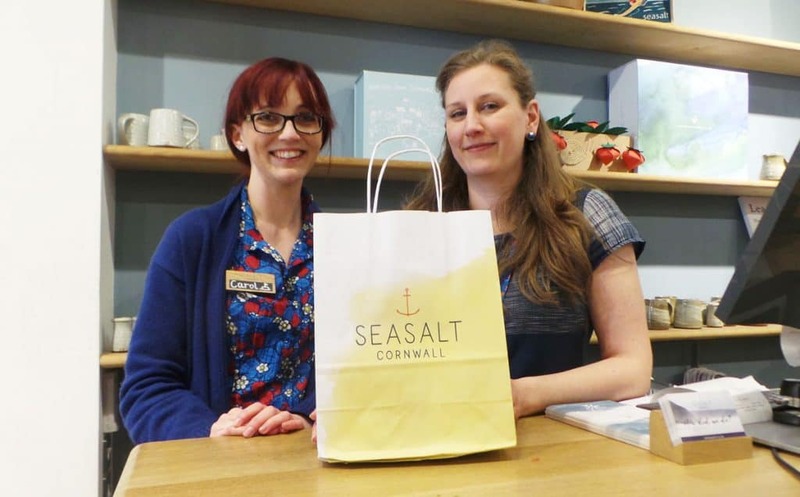 The staff at Seasalt are very impressive. They have a fantastic knowledge of the stock, were incredibly helpful and clearly both have a passion for the brand and its ethos. Couple that with a professional but laid back selling style I felt totally at home in the store. I will be back. I took my hunt for the bottom half of my £25 outfit to M&S. I was hoping to replace the best linen trousers in the world. I bought them 2 years ago and I have loved them so much they have stretched. Although I found a super helpful shop assistant who was really happy to check for me, they didn’t have any in my size. They did have a rather lovely pair of responsively sourced cotton chinos for £14 in a very pale blue. 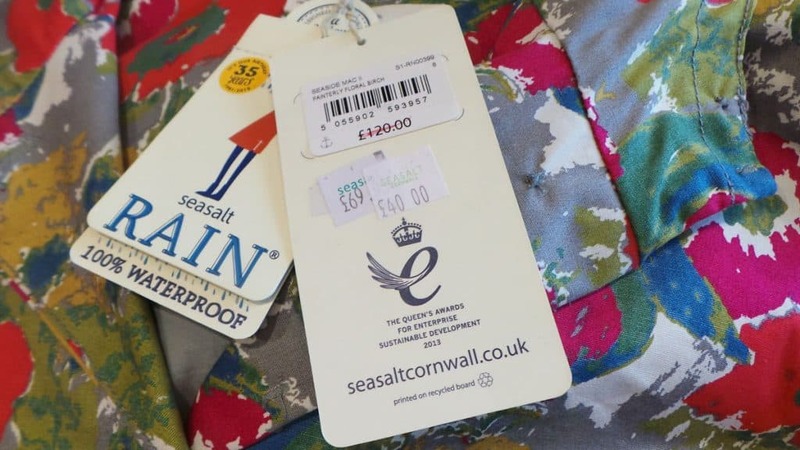 M&S have a large and diverse ethical policy called Plan A but they came out well in the Good On You search as a Carbon Trust certified brand and it is involved in the Sustainable Clothing Action Plan (SCAP) which is using collective action to minimise the environmental impact of our clothes. I had an ethical outfit for £23! I could have got more things. There were trousers in M&S for £9.50 but I’m all about less is more. The top and trousers I got will last a long time, won’t date because they are classics and are versatile too. This is where I had a little ethical packaging fail but, because of the credentials of Hotel Chocolat I feel that this is offset. 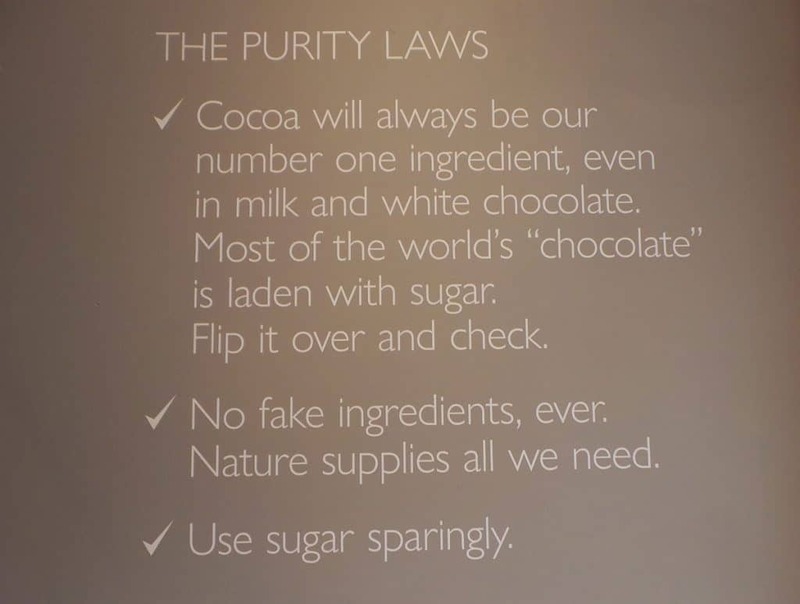 Also, I was tired and, well, chocolate, really nice chocolate made me forget all about zero waste. The Hotel Chocolat store at Clarks Village has all the usual stuff you find in their normal stores plus half a wall of reduced stock. It was here we found the perfect end to the day and for £4 we got twice as much chocolate as we would have for £3. So I was £1 over budget. Where I failed here is with the plastic packaging. You can recycle it in some places, but not others. 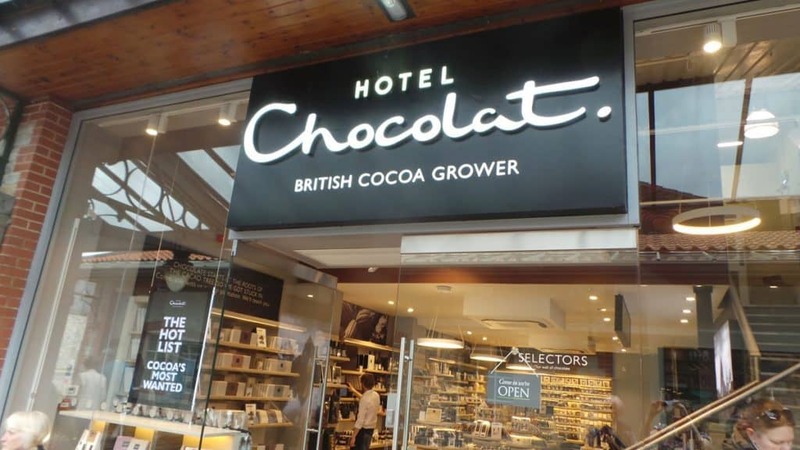 Hotel Chocolat are doing their best with packaging sourcing almost all of it from the UK or EU instead of flying it over from Asia. 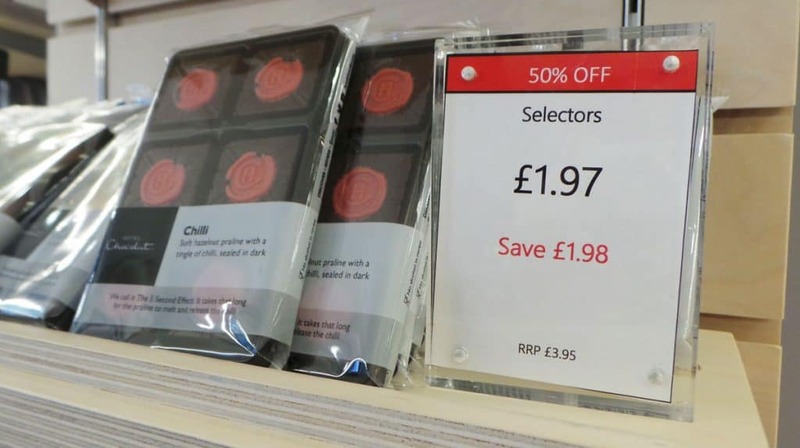 The majority of their chocolate is made in the UK too. Denby, Portmerion and Dartington Glass are all made in the UK. Very slight seconds of all of these are very reduced. I saw a large glass candle holder for a fiver and my shopping companion replaced one of her broken Portmerion plates for £4. 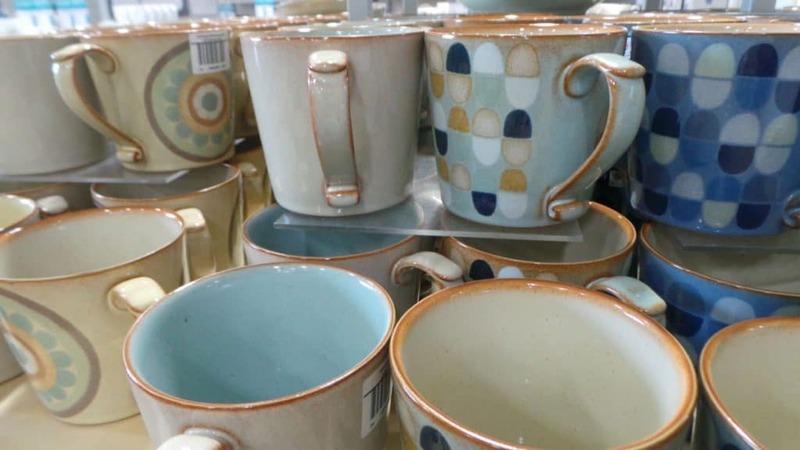 I rate Denby as a brand because my crockery is all vintage Denby from the 1970’s. I found it chucked into a box in a junk shop, grubby and dusty but unchipped after almost 50 years. It is ethical and sustainable to use things that last. If you have the money to invest in Le Creuset they guarantee their enamelled cast iron cookware, for the lifetime of the original owner, even if it is a gift. I have a friend who lives close to Clarks Village so we went to see her for coffee. However a quick google made The Cornish Bakery stand out as the place to get ethical coffee at Clarks Village. It is sourced direct and roasted in the UK. I’m told they reduce the pasties at around 5pm too. I didn’t go in any of these but I’ve done the research for you if you are tempted by them. Holland & Barrett have a Plan-it-Green policy (good pun!) It is long so I’ve just taken out key bits here. They aim to source over 95% of our products from suppliers in the UK. “Throughout our history we have supported the manufacture and supply of the products we sell in ways which help to protect the world’s natural resources and habitats. Our aim is to be carbon neutral; reducing our carbon emissions and, if they cannot be eliminated, investing in carbon offsetting programmes. We will ensure that over 90% of the packaging for our own label products is recyclable and, by 2012, we will at least halve our landfill waste. Molton Brown have not tested on animals since 1973. Cotton Traders are fighting modern slavery. “We behave in a responsible and ethical way and take modern day slavery and human trafficking extremely seriously. We are fully committed to taking action to combat modern day slavery and human trafficking and also to uphold human rights across all of our business and our supply chain. Hobbs say they recognise the fundamental importance of operating to a high ethical standard of business practice through transparent and fair means. “Our code of conduct covers the following: Human Rights; Labour Practices; Health and Wellbeing; The Environment; Fair operating practices; Animal Welfare; Community Involvement and Development. Superdry are members of the Ethical Trading Initiative (“ETI”) and have adopted the ETI Base Code as their Ethical Trading Code. “Our Ethical Trading Code sets a minimum benchmark ethical standard for all factories across our supply base, in all countries. Our Ethical Trading Code and wider policies – including requirements and guidelines for the ethical treatment of vulnerable groups of workers including migrants and homeworkers – are included in our Supplier Manual which all suppliers are required to sign up to prior to working with Superdry. 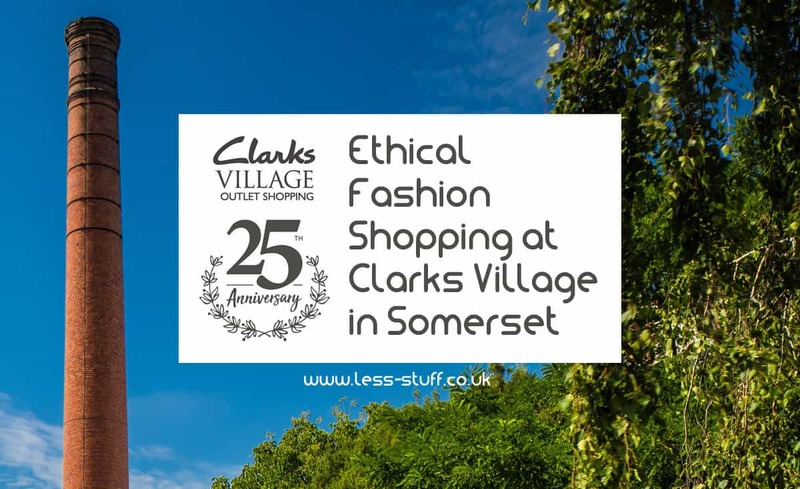 It takes a tiny bit more planning to check the retailer’s websites first, but it is surprisingly easy to find sustainably sourced and ethical bargains at Clarks Village. I’m genuinely surprised by this, I usually assume cheap clothing means battery hen type conditions for the workers. The shops I went into at Clarks Village sell good quality, well made items and they are looking after the people who make them. There was one other thing that made this shopping trip a great experience and that was the staff. Every single person I spoke to, from assistant to managers, had in depth knowledge of the products and enthusiasm for the brand. I’m a Fashion graduate and I’m used to going into shops knowing more about what is on the rails than the staff. There was no risk of this happening at Clarks Village, instead I got helpful advice and some great ideas. If you wanted to get more ethical Brownie points you would shop at a charity shop. Since charity shops became homogenized and all sell the same thing I’ve not found anything either in my size, or that I like. My strategy now is to either make my own clothes or to buy them as ethically as possible. Before this little shopping trip I thought ethical clothing was well out of my price range. Doing little bit of research and going to Clarks Village opens up a whole new world and if I buy a few key items each year, my wardrobe will be better off for it. I’m already saving up for another trip. Disclosure: Clarks Village gave me a £25 voucher to spend and paid my parking of £3. I have not been compensated in any other way for this post and it contains no affiliate links. Summer Opening Times From Tuesday 30 May – Sunday 3 September.